Sights and sounds from house and garden! 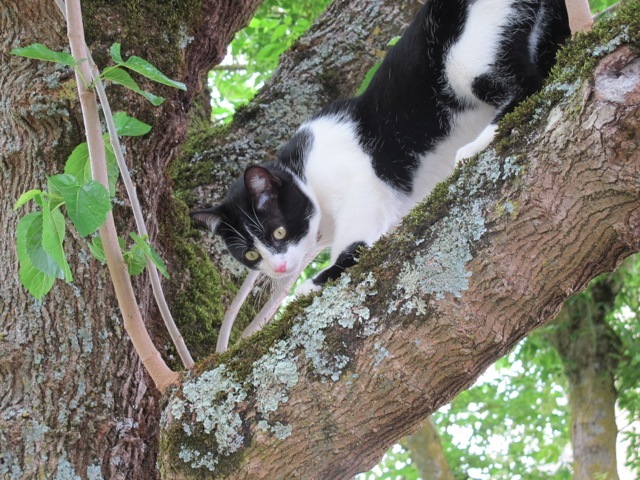 This morning I was doing my Yoga for Softies routine under the trees in the garden when I heard a noise overhead–a sort of chug-chug. Odd sort of bird sound I thought. 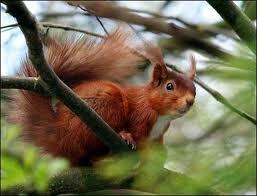 In fact it was a red squirrel doing his rooftop rounds–checking out the early fruit on the wild mulberry. I watched as he elegantly progressed past the church facade and towards the hedgerow, disappearing from sight and sound and leaving me to my contortions. Two days ago as I was on my way to the tomato patch to water-in the last six plants, a branch of the Judas tree snapped overhead and fell at my feet. 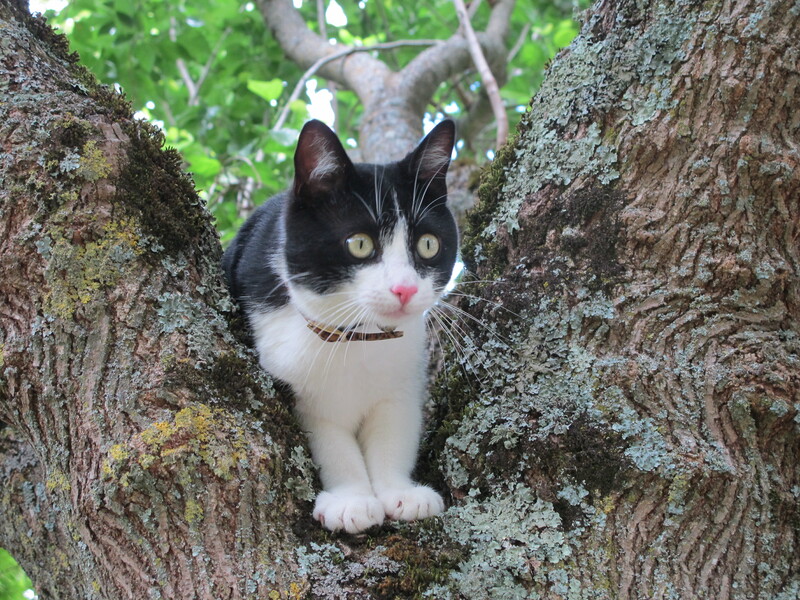 I looked up and there was Beau–looking down big-eyed at me from even higher than this morning’s squirrel–clearly surprised but otherwise unworried. I was the worried one and started shouting for him to go back when Meredith came out and said calmly “ignore him”! Sure enough as I returned, watering over, there he was on a low branch readying himself to leap onto the garden table! If you stand still in the courtyard these days and listen carefully you become aware of a low tweeting and twittering. 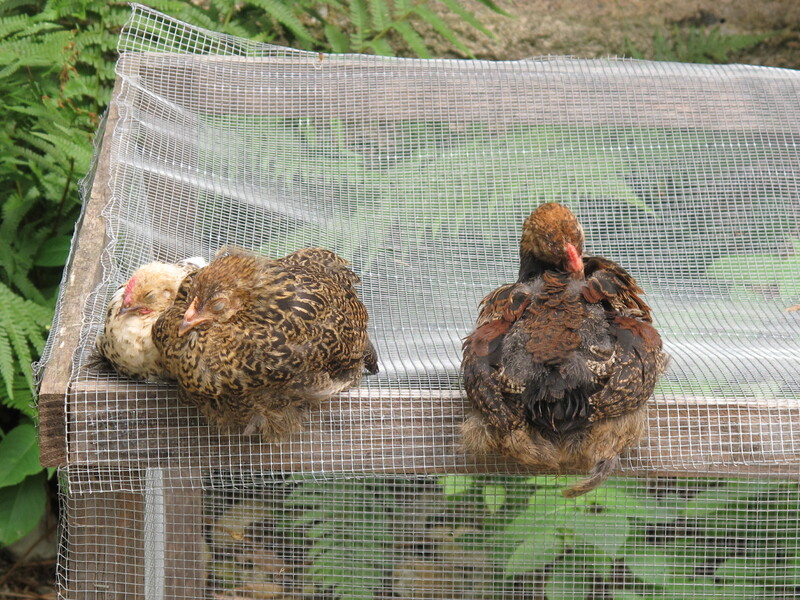 If you listen harder you might be able to locate the three little hens–working the undergrowth like fully grown adults and on their very own social network–keen to show us that in fact they were the trend setters and the whole world has followed their lead! Searching for a trowel in the pigeonnier last week, I heard a snoring sound. Quite loud–the sort you might expect to hear in the lounge of a traditional men’s club in London–after lunch. I looked high and low–and eventually found the source–snugged in deep on a shelf against the wall, masked by a small bowl. He is not well. His left cheek shows signs of swelling and his eyes run–the cancer in his nasal passages causes the snoring sound. He eats and shows his customary friendliness to us and has some quality of life, but at some point we’ll have to make the painful decision. For the time being though he still likes to encourage me to keep going on the yoga mat and not be distracted by a chug chug from above! on June 11, 2012 at 6:59 pm | Reply Pat H.
Thank you for reminding us that if we stay still for a moment, we open up a whole world that is usually ignored. I empathize with having a sick animal. I have had to put down several due to illness. Best of luck and know that you will do the right thing and end suffering the most humane way possible. on June 11, 2012 at 7:17 pm | Reply Caroline P.
That’s a beatiful story! I enjoy reading this and it makes me feel in different moods especially about Marmelade. 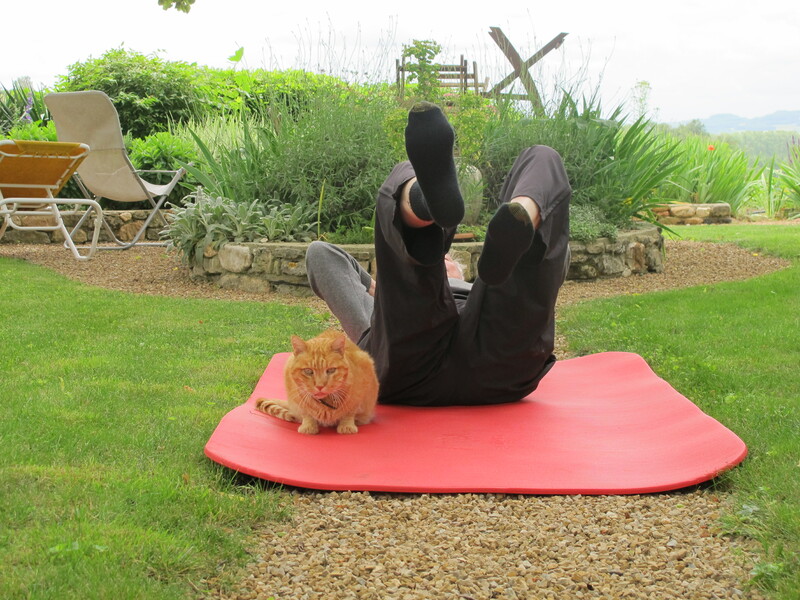 I hope he did enjoy your exercises but I wonder what he is thinking …something like: Is this really necessary? Perhaps he starts a blog on you! What a very moving post Robin, nature has a way of bringing us closer to the real meaning of life,and can throw a spanner in the ring or a bright eyed squirrel and a inquisitive young kittie.your little chicks are doing well.I am so sorry to hear that your beautifull Marmalade is unwell,but I know that he know’s he could not have more loving or caring people to be with. Sorry about Marmalade…but what a wonderful life he has had and obviously you will know when he is suffering. It’s beyond heartbreaking. But we animal lovers know that their love, antics and companionship outweighs our heartbreak. My dear Claude (the one that I had to get the professional tree climbers for..oh, and get this- they were named Wilma and Fred and reminded me of Jud and Prudy! They were real characters) died about a year and a half ago. I was devestated, but my consolation was that I knew that he was King of the Castle and really did have a good llife. Spoiled rotten just like your cats! Hello Dear Robin,Sorry to hear about Marmelade’s condition, I hope the cat recovers.Mostly cats heal themselfs but when it gets too bad…14 is not to old yet, see how it devolpes.Does she eat and drink enough?My cat puskepuske sits next to me at the keyboard snoring( she’s getting 8(I think) of age in october).Hoping Marmelade gets better.Sometimes I wonder what would we do without cats, they keep the house and surrounding free from mouse, rats and other creepy insects.They give so mutch and asks so little, we give a lot of love to them what is necessary and we get so mutch in return.A lot of hughs to you and Marmelade and from Puskepuske too! Hello Robin. I’m one your antipodean followers; I reconnected with Poldark this year after my husband bought the DVDs for my birthday. I remembered the series from the 70s and I was not disappointed to watch it again – I basically lived and breathed Poldark for a whole week, and then wanted more! I did not know your cat Marmalade had cancer in his nose. I was wondering if it is cancer or FHV (feline herpes virus), as some of the symptoms sound similar? Our cat CeeBee, a 13 yro male Australian Mist, has FHV and has had some terrible flareups with coughing, nasal discharge and weeping eyes. We have it under control with daily (expensive) medication (vibravet and famciclovir) and occasional supplementation of ventolin and nebulisation with gentomicine & saline. After lots of trial and error (and a great deal of money) we eventually got great advice from a Prof of Vet Sc at Sydney Uni who did not charge us a cent! I wish Marmalade well, and I’m sure you’ll know the right time to make the decision for him. Thank you for that info and experience, Pamela. Meredith and I will ponder. It’s a pity animals do not live as long as us humans. Always broke our hearts when our pets died. Good thoughts and wishes for Marmalade. So tough, but we want what’s best for our furry friends. Just had dental work done on our 15 yr. old Molly. Mark suggested rocks and a sack, but got a look from me. All the mice she’s caught, she’s worth the vet bill. So sorry to hear about Marmelade! Your post brings out the importance of taking a moment each day to marvel at the world around you. I will try to do the same. Thanks! Over the past 16 years my sons and I have buried 5 dogs, 2 cats, one hamster, 4 lizards, 2 birds, mice…and we lost a 3 foot snake in our house 10 years ago..never found the snake!! Some of the animals are buried in my front and back yard. Burying the dogs and cats was devastating because they were the constant in our topsy turvy lives for those years. I now have one dog and one cat. The cycle of love and companionship continues. Very sorry, Robin about Marmelade. on June 12, 2012 at 2:52 pm | Reply Dianne P.
Am so sorry to hear that Marmalade is ill. We’ve been having our own rough time. We lost Oreo on the 31st. It was right in the middle of all our end-of-school craziness to do, and I feel I did not give him enough attention those last few days. I knew that his teeth were bothering him, and had made an appointment to get them trimmed, but I never suspected anything else. He was still eating well, a little quiet, but still played ball a few times. I just figured we’d have a few rough days until his appt, then I was so looking forward to free time with him for the summer. We never got that. It was the one time WE didn’t have to make the decision. But it wasn’t any easier that way. It’s so hard to look down and not see him running around at my feet. Again, so sorry to hear your news. Sad story, Dianne–on s’attache aux animaux as our friends here say. and distilled water. Fill small glass container with 1/3 of salt. Fill the rest of the container with water. Wait two hours. Place a drop or two in the eyes a couple of times per day. The solution will make him feel so much better. Hi, Linda. This is an interesting treatment for cats’ eyes in an emergency. Do you by “sole’ ” mean saline solution? And where Himalayan salt could be bought? I’ve four very healthy young cats at present but I would appreciate the knowledge of this particular remedy. Thank you. Lovely pictures. Even the yoga pose. I think Marmalade has still got some life. She has a beautiful place to live and I don’t think she is ready yet. She will tell you when.